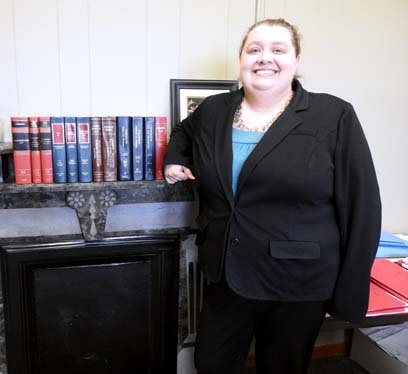 Garrett Neese/Daily Mining Gazette Brittany Bulleit was appointed April 1 as Houghton County’s new prosecuting attorney. HOUGHTON — After almost a decade as Houghton County’s assistant prosecutor, Brittany Bulleit has ascended to the top spot. Bulleit was appointed as the county’s prosecuting attorney on April 1. She replaces longtime prosecutor Michael Makinen, who had been in the post since 2009. Bulleit joined the prosecutor’s office as assistant prosecutor in mid-April 2009. She began as a law clerk in Flint, working for a judge who did family court matters. When he died shortly after, Bulleit was able to find work closer to home. As with her assistant prosecutor role, Bulleit is learning on the go. Over the past decade, she has gotten much more comfortable in the courtroom, she said. She has also developed good relationships within the community, including victims, law enforcement and courthouse staff, as well as people in supportive roles such as the Barbara Kettle Gundlach Shelter and Dial Help. Jesse Belanger, who started in the prosecutor’s office as assistant prosecuting attorney in January, will replace Bulleit as chief assistant prosecuting attorney. Belanger is a graduate of the University of Michigan and Wayne State University Law School. Bulleit is a graduate of Houghton High School, DePauw University and Michigan State University College of Law. She began as a psychology major. While spending a semester off-campus, she began looking at forensic psychology programs. That still wasn’t the right fit, but it led her to law school. “I felt like it integrated the psychology aspect, which I was still interested in, and the law aspect, which I had become more interested in throughout college,” she said. Working as prosecutor lets Bulleit use both sides of her education. Bulleit will serve the remainder of Makinen’s term, which runs through 2020. She said she plans to run in the next election. She said her priorities are to keep the office running smoothly and continue what she’s been doing.